Tucked away off the beaten path of M-25 in Huron County lies the village of Grindstone City. In 1834, the natural harbor drew Captain Aaron Peer when his schooner, the Rip Van Winkle, sought safety during a storm on Lake Huron. When the crew evacuated the ship to explore the wooded lands they discovered unusual flat stones along the shorefront. Peer took some of the stone samples to Detroit where it was deemed these stones were superior to the Ohio flagstone planned to pave small sections of Jefferson and Woodward Avenues. 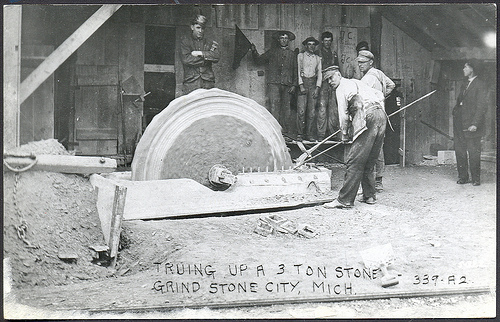 Detroit ordered enough rock for the job from Peer, and this began the export of stones from Grindstone City. Of course, the stones were not destined to simply pave streets. Soon, Peer’s sailors discovered these stones were ideal for sharpening their tools and realized they would make excellent grindstones. In 1836, Peer purchased 400 acres of land, becoming the first person to locate land in Huron County, and established his grindstone quarrying operation. After 50 successful years of producing grindstones, Peer sold the business to the Cleveland Stone Company who became the sole proprietors of the industry and the last to operate the quarries. The largest stone ever turned from Grindstone City weighed over 6,000 pounds; the memorial stone on the corner of Copeland and Rouse Road is said to weigh 4,750 pounds. Fun fact, Grindstone City was nearly named Stonington. In 1870, owners of the quarry noted the fast growth of the village and that it ought to have a name. Stonington was suggested, but once Grindstone was suggested, and the word City was added, the village went to be known as Grindstone City from then on, though it is actually a village. Aside from its historic past where it was nicknamed the grindstone capital of the world, Grindstone City has emerged as home to some of the best charter boat captains and a location sought out by fishing enthusiasts throughout the state. Various tournaments take place throughout the year, you can launch your own boat from the Grindstone Marina or Grindstone City Boat Launch, or book a charter boat captain to take you out to fish. You can even have your fresh catch cooked at Captain Morgan’s Grindstone Bar & Grill! Over the past few years, the community of Grindstone City has been working towards improvements to the local businesses, while the Friends of Grindstone City DNR have made it their mission to create a beautiful, more accessible harbor and kayak refuge. The Friends of Grindstone City DNR were assisted by the Huron County Community Foundation when they received a grant to for $2,000 to revitalize the Grindstone City Harbor. Since receiving the grant, both peninsulas have been cleared of overgrowth and the line of sight from the shoreline to the water had been restored. You can see them featured in the Foundation’s annual report, here. For a fantastic meal any time of year, visit Shelley’s Bar & Grill. A summer trip to Grindstone City isn’t complete without a visit to the Grindstone General Store or Rybak's Ice Cream Store for a generous ice cream treat. 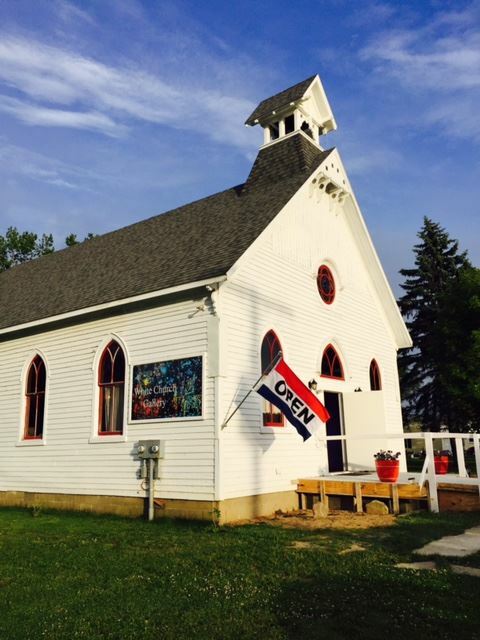 After enjoying your ice cream, head over to the White Church Gallery for unique art and gift items in a beautiful old church. What are your favorite things to do in Grindstone City?